Patients with complicated medicine regimes often find it hard to keep track of which pill is which, since most pills are only identifiable via tiny engravings. This is especially true for those who are visually impaired. 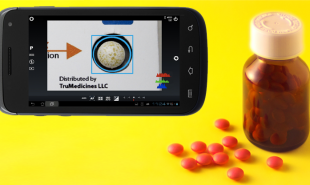 A new android app called TruScan from TruMedicines hopes to help end this confusion by enabling patients to identify their pills audibly via their smartphone. TruMedicines create interactive pharmaceuticals which help extend patient care beyond clinic visits. Their new app combines cloud-based image recognition, which provides immediate pill identification, with TruSpeak — a feature that enables patients to have their pill information read to them aloud. Patients can also opt to view the pill’s details visually, in large, clear text on their phone. TruScan will reveal everything the patient needs to know about the pill in question, from the name of the drug and its strength to its expiration date, drug warnings and even alternative options. The information is available in 52 spoken languages. Are there other ways of helping patients keep on top of their medicines?